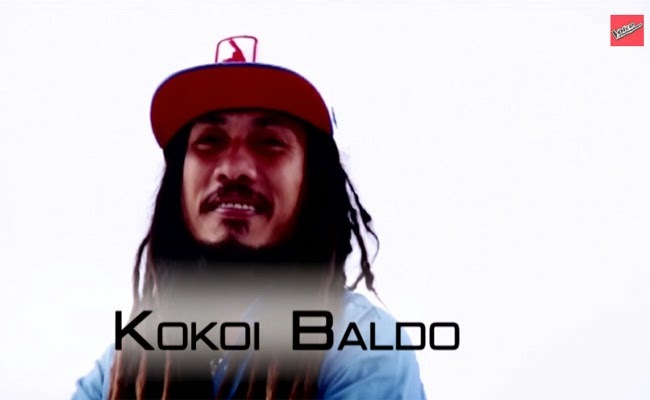 Kokoi Baldo sings ‘Message in the Bottle’. The Voice of the Philippines Season 2 had finally chosen the Top 8 for semi-finals with the help of the voying public on February15, 2015. Team Sarah’s Monique Lualhati, Jason Dy, and Kokoi Baldo did not back down, pouring their hearts in their chosen song. With Team Sarah, the artist with 41.61 percent of total votes is Kokoi Baldo. He had been saved by the votes and the first to be in Top 12 from Sarah’s team. Monique Lualhati is the second artist saved in Team Sarah. Sarah then chose to save Jason Dy. Kokoi Baldo shared that he is still not married with his current partner whom he met in Bacolod. He said that the first time he met her, he had felt the spark. He had chosen her despite being in a relationship at that time. He said that he is willing to fight for their love and prove that they can be happy together. Apl said that he had enjoyed the performance. He is like a modern Bob Marley but he is still Kokoi in movements and voice. Sarah shared that she had been his strong believer and he is able to do justice in any song he performs. The voting lines had been opened after the three artist from Team Sarah had performed their pieces. The public was given only 5 minutes to vote. The one having the highest voting percentage will be automatically saved while one will be saved by their coach. Only two will go on as part of The Voice of the Philippines Top 8 for Semi-Finals.